My OBD2 reader and my instrument cluster reports a short circuit somewhere on the wire, for the Passenger airbag squib 2. 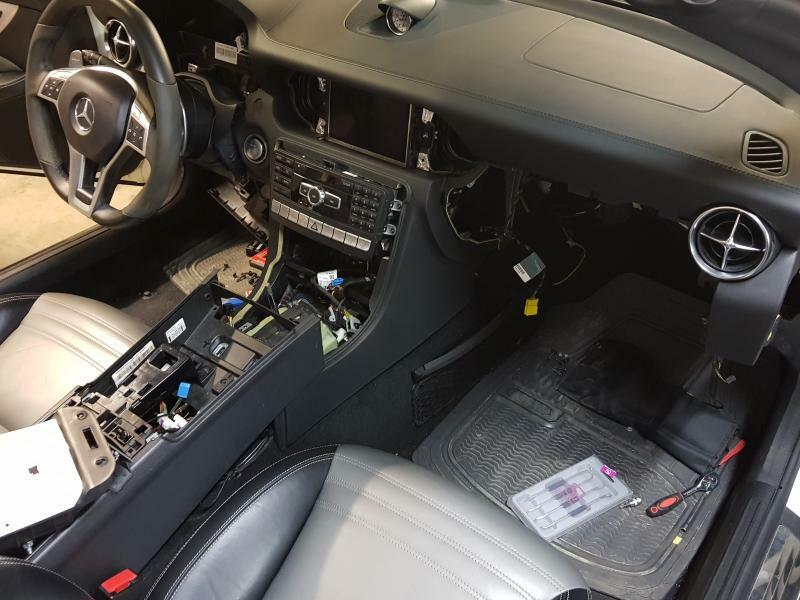 The passenger airbag has two squibs, the R12/4 and R12/5, from which a 2 and 2 wire cable comes and connects into the X28/12 plug (4 wires). When unplugging this wiring from the X28/12 connector, the short circuit error dissappears (but an open circuit error appears, logically). This leads me to believe that the short circuit occurs between this plug (X28/12) and the airbag. 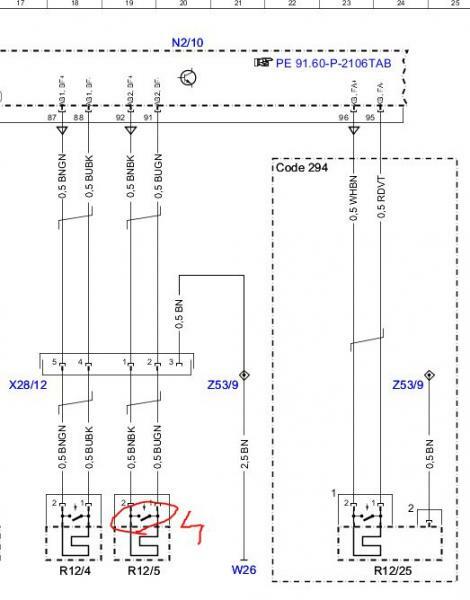 Now, on the WIS wiring diagram, I see there is a switch on the R12/4 and R12/5. If I remove the wiring entirely, the multimeter reports no short circuits on it. But if I plug the wiring to R12/4 and R12/5, both 2 wires for both plugs/squibs report a short circuit on the multimeter. No error is shown for any short circuits on squib 1, though. Do you have any idea if this switch is supposed to be open or closed? Also, do you know how that switch is being actuated? 1 - I realize there is some spring in this switch (X28/12), which makes a short circuit on the wires for R12/4 and R12/5, when this plug is disconnected. I made sure the spring makes no contact, when checking with the multimeters for other short circuits. 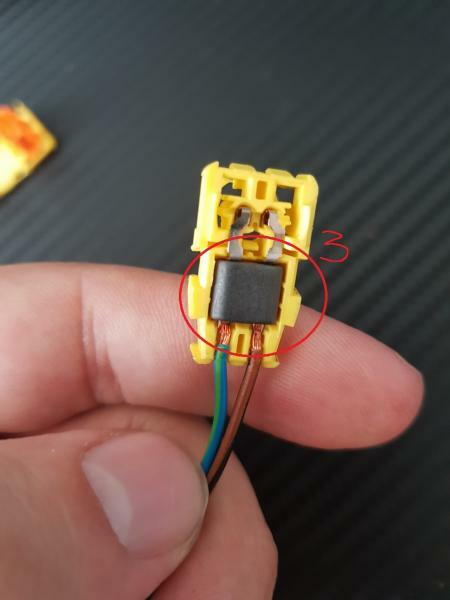 2 - That orange thing must be pushed in, when the squib plug is connected. Perhaps that actuates the switch from the diagram? 3 - What is that? Is it only reinforcement for the wires, so they don't break? Sorry for being so technical, but I think this can only be explained in technical words. As this is a critical safety system it has enhanced fault detection, the switch mentioned is part of that. Is there a short on the airbag side? 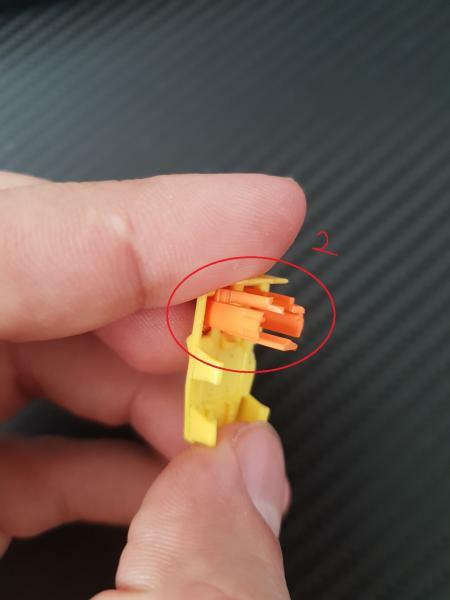 The Orange tab connector design is to facilitate proper connection easily. If I remember correctly pushing the tab on a disconnected wire will not resolve fault. This means a Star/DAS would be able to tell me the exact wiring which has issues? the switch mentioned is part of that. So what does this switch do, more specifically? 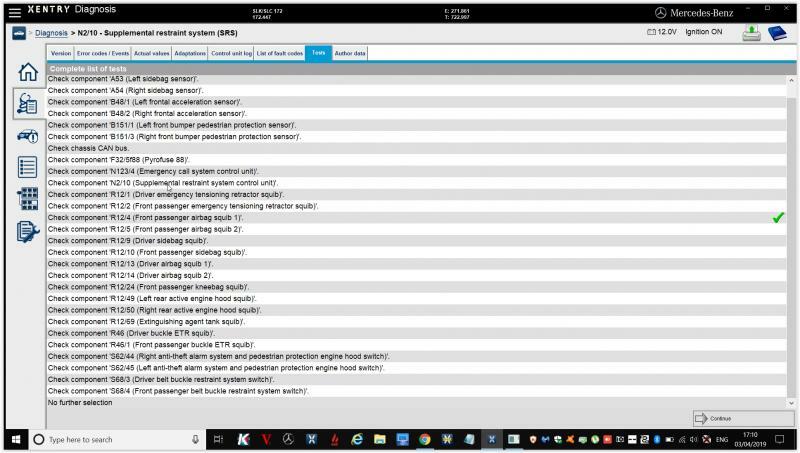 Not sure where the short is, using a generic OBD fault reader, all I get is error code "8011 Short circuit between two wires on passenger side airbag squib 2". Playing around with the multimeter, and plugging/unplugging the X28/12 connector, it looks like the short is somewhere between wiring AB2 and the internals of the airbag. Xentry won't tell you much more. Remember you are working with explosive devices, keep away from the inflation path and keep the inflation path clear, risk of serious injury or death. 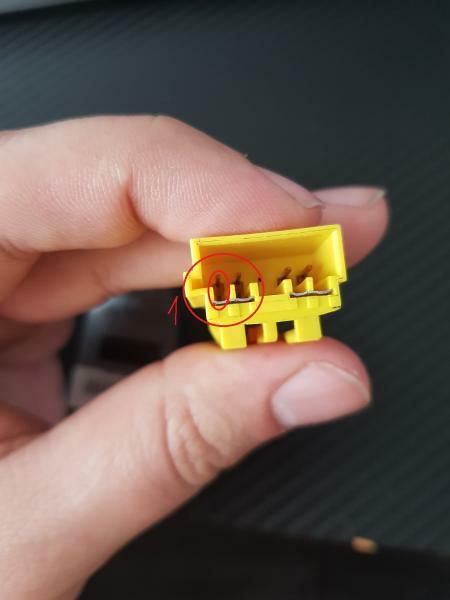 The switch shorts the terminals when the connector is disconnected. If you had an open circuit problem you could use this to diagnose. For your car, you need Xentry ( das is for older models ), on xentry you will be able to do further tests. 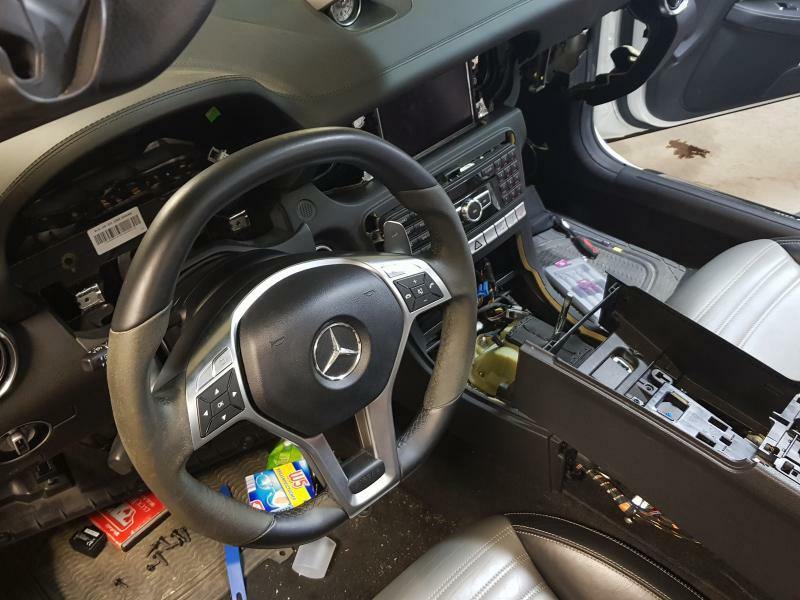 Got a spare airbag from a 2017 SLC, from Poland, for little over 100 Euros. Replaced it, and now all is fine. Those switches are called "shorting bars", and if that orange bit isn't fully snapped into position you'll see these "short circuit" messages. Haha too little too late. That is exactly the confirmation I was looking for. When I replaced my dash, to a leather one, I broke part of the plug, because from below, the orange thing wasn't visible/obvious, that it needs to be pulled out (even now, I think you can (comfortably, at least)) only pull the orange thing out, once the airbag is removed from the dash (which requires pulling the dash forward). The new airbag came with the wiring as well (although UK wiring), so I replaced the plugs on my wiring, with the plugs from the new wiring. Probably, at this point I have a fully functional airbag in my closet, but I'm currently too lazy (yesterday was enough) to pull the car apart again, and test it with the new wiring/plugs, so at this point, I wish I didn't even know about this information )) (I should have probably done that yesterday, though, didn't cross my mind).